For most of my visit to New York City, the changes I saw from my 1988 trip were relatively minor — different stores in Times Square, that sort of thing. The amount of time that had passed didn’t really hit me until, of all things, when I went to the ladies’ room at The Cathedral of St. John the Divine (from here on in, I’ll just call it “St. John the Divine”). St. John the Divine is an Episcopal cathedral at 110th Street and Amsterdam Avenue in Morningside Heights. The cathedral, begun in 1892, is being built in the medieval style. Rather than putting stone over a steel structure, St. John the Divine is all stone. And this is why I say that it “is being built.” Original estimates of construction were that it would take literally centuries (some sources say as many as 700 years). They hired British stonemasons to come to the United States and train local residents in stonecutting. Money for construction ran out sometime in the late 2oth century. As a result, St. John the Divine may remain unfinished forever. The scale of the project and the beauty of the building made an impression on me. Alex is taking European (or possibly World, I can’t remember what they’re calling it) History this year and so I insisted on visiting the cathedral so that he could see what the medieval cathedrals looked like in their youth. I recall that there were still stones in the side yard during my first visit, but as they are no longer doing any work on the cathedral, those stones are gone. 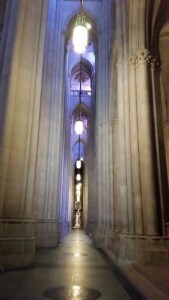 St. John the Divine is accessible to wheelchair users, though they do give some tours which are not wheelchair accessible. Oh, and about the bathrooms. When I was there in 1988, the restrooms were in a temporary structure. It has been a long time, but I seem to recall the stall doors were plywood. I needed a restroom again this year (I honestly did not say, “I wonder what the restrooms look like these days” and seek them out). I knew which direction they were from my first visit. They are now an apparently permanent part of the building, which was disorienting enough. But they look worn, like they’ve been there, well, for at least a quarter of a century.